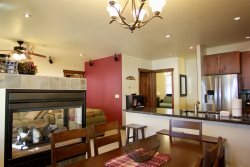 Deluxe Two Bedroom Property, just outside Center Village, Copper Mountain! What time is check-in / check-out? Check-in begins at 4:00 pm and checkout begins at 10:00 am. Let us know if you'd like to alter these times in any way. If there is no same day arrival/departure, we would be happy to grant you an early/late check-in / check-out. Are your vacation rentals pet-friendly? es, we do have some homes that are pet-friendly. Just select "Pet-Friendly" in our advanced search options to see what's available. Do you provide Vacation Rental Insurance? CSA Vacation Rental Insurance has been offered with your reservation. Vacation Rental Insurance reimburses for pre-paid, non-refundable expenses due to certain unforeseeable circumstances that may jeopardize your vacation investment and force you to incur unplanned expenses. We strongly recommend you purchase this valuable protection. What do I need to bring on my Colorado vacation? Be prepared for the weather! Make sure you have good shoes whether it be for hiking in the summer or walking through the snow. A good jacket for the winter time and warm clothes for the cool summer nights. Visit our weather page for more information on seasonal temperatures. What is already in the rental property? Every rental is equipped with hotel quality bed linens, plush towels, hotel-sized toiletries in each bathroom (shampoo, conditioner, soap), paper products (toilet paper and paper towel), a starter dish soap/sponge pack and the kitchen is fully stocked with cooking utensils and basic spices so making a home cooked meal is an easy task! Where can I purchase lift tickets for the local ski areas? Lift tickets can be purchased online or at the ski resorts. We highly recommend purchasing the Epic pass if you plan on skiing for multiple days! What about snow removal when I am visiting in the winter? In the winter time, the snow will be removed by the HOA or the plow company. The plow company will plow anytime there is snowfall over 4 inches. If you need someone to come to remove snow, please call us and we can arrange for the plow company to come out to your property. What is there to do in Breckenridge & Summit County? There are so many fun and exciting things to do in Breckenridge and Summit County on your next vacation no matter what time of year you are visiting! From thrilling snowy winter activities to relaxing summer events and goings on there is something for everyone to enjoy. Visit our local area guide for all the details! Not finding the answer you are looking for? Visit our contact us page and fill out a quick form or call our office toll-free at 1-866-513-4500. Our team is happy to assist you!